Journey and the Steve Miller Band are in the midst of their 2014 summer tour, and Clay Paky Sharpys and grandMA2 consoles are along for the ride that will take them to 30 cities across the U.S. and Canada. A.C.T Lighting, Inc. is the exclusive distributor for both equipment brands in North America. The tour unites two of the iconic groups that helped define The San Francisco Sound. In careers spanning 40 years, Journey has sold 80 million albums worldwide and the Steve Miller Band more than 30 million records. Tour Tech East Ltd. in Dartmouth, Nova Scotia is providing lighting support for the tour supplying 34 Sharpys, 20 Sharpy Washes plus a pair of full-size grandMA2 consoles with two NPUs. Senior account executive Tracey Ploss has worked with Journey and the band’s lighting designer Kevin “Deuce” Christopher for eight years. “Last year Deuce used a couple of Sharpys, but this year he specifically wanted Sharpy Washes for the tour so we added them to our inventory,” says Ploss. “We’ve made a significant investment in the Clay Paky fixtures.” Sharpys are very popular with Tour Tech customers for their output, size and low power consumption. 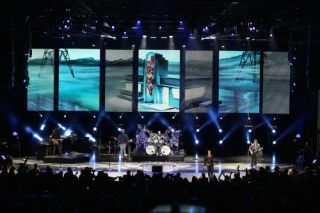 Fixtures are currently out with Styx and Foreigner, and the Calgary Stampede deployed a large number for its famed rodeo. The Sharpy Washes enable him to “go from a very narrow beam for nice graphic geometry to a wide beam for a silhouette look on the band and wash out in the audience.” Their light output also had to be able to stand out against the video display. The scenic design for the band calls for Richter to block off the Sharpy Washes on the rear lower truss with a fiber optic drop and a full stage drop designed by Stanley Meyers for “Jet Airliner” in which the Sharpys play a key role. "I've had the pleasure of working with Deuce over his last few Journey tours - he's always thinking of new ways to bring their performance to life for the audience. I knew the Sharpy Wash would be a nice addition for them and I was very excited that he liked it so much. Tracey and the Tour Tech East team are also great to work with, so the entire project has been a pleasure for A.C.T,” commented A.C.T Vice President, Automated Lighting, George Masek.